Description: "In 1989, Lakefront Brewery owner, Russ Klisch was reading dusty brewing tome, tipping one of our fine lagers and came across a beer recipe that Thomas Jefferson had brewed with pumpkin at his home in Monticello. Pours a light orange with an off-white head. Flavors of cinnamon, nutmeg and cloves meld well with a slightly sweet background that actually does taste a bit like pumpkin. Caramel and Munich malts reinforce this beer's mouthfeel and lend to the malty sweetness. Serve our Pumpkin Lager with holiday meals the spice characters really bring out the depth of full-flavored meats and vegetables. Random thoughts: This is the first Lakefront beer I've profiled. 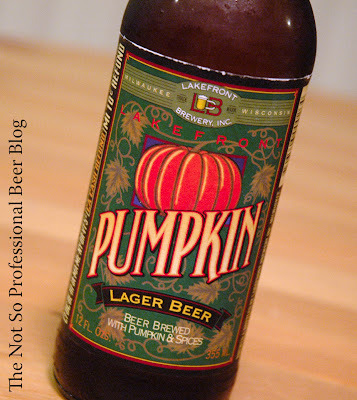 It's also the only lager in my Great Pumpkin Beer Roundup. In fact, Lakefront Brewery claims it's the only pumpkin lager available in the world! I'll take them at their word. The tasting: Light copper in color, clear, with a white head that dissipated quickly. Sparse effervescence is visible in the glass. Aroma of spice! Of the pumpkin beers I've tasted, this has the spiciest aroma—by far. Think pumpkin pie potpourri. It's got the cinnamon, clove, and nutmeg like the others. But the cardamom puts it over the top (in a good way). Since the spices dominated the nose, I expected them to totally overpower in taste—fortunately, they don't. They're strong, but somewhat restrained in flavor (relative to aroma). After the rush of spice, caramel and bready malts are noticeable along with a touch of alcohol. 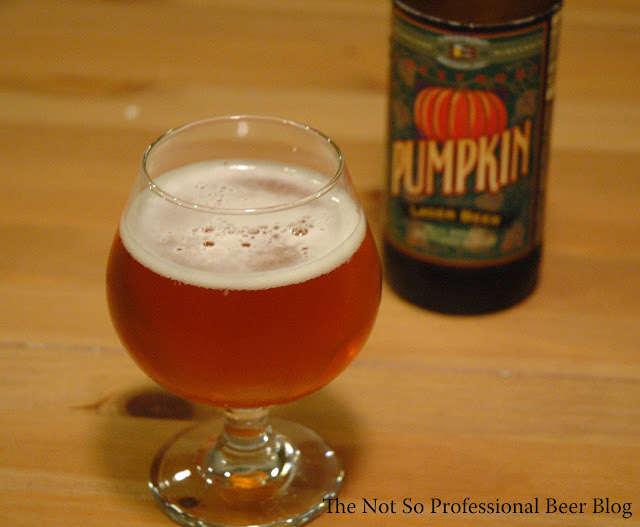 Pumpkin Lager is light bodied, lightly carbonated, and has a smooth, crisp mouth feel. It finishes with...care to take a guess? Spice. Rating: 3 star. Good. I would drink this again if someone gives it to me. Pumpkin Lager is a nice beer. If you're into the pumpkin pie spice mix—look no further. Personally, I would have preferred a heftier malt profile to balance it out. Have you tried Lakefront Pumpkin Lager? What are your favorite pumpkin brews? Oakshire's Hellshire II Imperial Stout Announced! 2011 Holiday Ale Festival Details Announced!